We were attending a concert the other night (B.B. King, if you must know, and yes, it was excellent! ), and I saw something that once again proved my growing belief that heraldry can be found just about everywhere and anywhere you look. In this case, there was a display (and a couple of young ladies giving out samples and selling bottles) of a Bavarian beer. 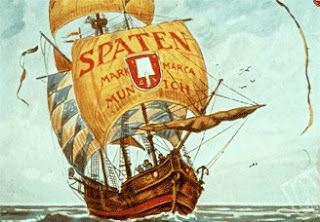 I particularly noticed the display because of the large banner (which had the paly-bendy azure and argent field of Bavaria over its entirety) with a coat of arms (the logo of the brewery, Spaten). Not being much of a beer drinker myself, I can’t tell you how good the beer is, but I did manage to acquire one of the coasters with the coat of arms/logo on it. 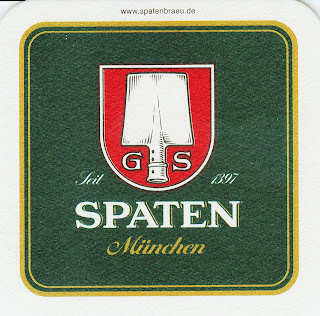 The most important dates in its history, at least insofar as their heraldry is concerned, are the ownership of the brewery from 1622-1704 by the Spatt family, who gave the brewery its present name (thus the canting arms, a pun on the name), 1807, the year Gabriel Sedlmayr (whose initials appear on the arms) acquired the brewery, and 1884, the year that graphic artist Otto Hupp designed the company logo. Many of you will recognize the name Otto Hupp for his impressive work in producing for many years the Kaffee HAG books of coats of arms and the 51 years of Münchener Kalenders where his heraldic style is so gloriously displayed. So the next time you go to a concert, look around. You just might find some heraldry!